Have you done the Elf on the Shelf tradition in the past, but want to try something new this year? Or, perhaps your children are a bit spooked out by Elf on the Shelf? Whatever the reason may be, there are plenty of wonderful alternatives to Elf on the Shelf. 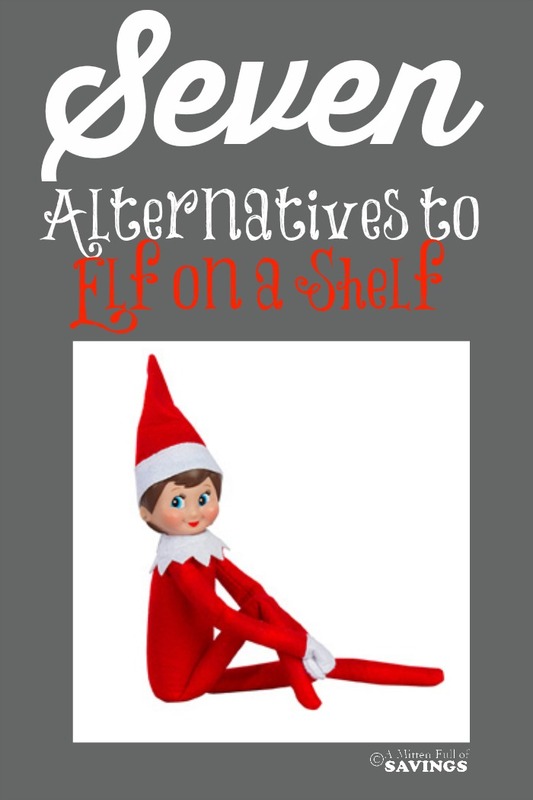 Take a peek below at 7 alternatives to Elf on the Shelf that you can try with your family. You are sure to find them just as fun! This year, your favorite snowman is looking for some adventures too! Grab your own Olaf on a Shelf doll and book and see what sort of trouble he can get into. This is a great gift set for your child to enjoy or to give to a Frozen fan you may know. You can find some great Hide & Hug Olaf Ideas here. Duck Dynasty fans are going crazy over the new Uncle Si Elf on a Shelf doll. What sort of adventures can you get Uncle Si into? Only your imagination is holding you back! The doll and book gift set makes a great gift for Duck Dynasty fans wanting a new spin on the elf on a shelf tradition. Get an angel doll or angel tree topper and hide it around the house performing good deeds. The angel can get caught folding clothes, writing a letter of thanks, or any other good deeds you can think of. Or, take the angel on your adventures of helping others this holiday season. Find a stuffed animal cat and have her get into all sorts of feline adventures. She can dive into the bag of cat food, place cat treats out, and hide under pillows. This is a great activity for feline lovers! You can grab a stuffed cat at your local dollar or thrift store. Find a Santa doll and use it to get into all sorts of Christmas adventures. He can pour out sprinkles, leave notes, and even hide in cabinets. If your children adore Santa, this may be a great alternative for them. Take a red pom pom and take turns hiding it all over the house. Whoever finds it needs to then hide it for the next person to find. Hide it in socks, in the tree, or anywhere you think someone will stumble across it. You can enjoy this fun game all season long! Cut a gingerbread shape out of brown craft paper and take him on your holiday adventures. Snap photos of him visiting all over town. He can go to the library, the store, school, and more. Who knows where he may end up! Elf on the Shelf is fun, but if you are looking for Elf on the Shelf alternatives, these 7 ideas are great to try! See how they work for you! Join in on the Elf Fun with so many ideas posted below- Follow our Elfie on his journey and find other Elf on the Shelf ideas in our Elf on the Shelf section of the blog! LOVE this (I am not an elf person). I think my fave is the Rudolf Nose. It gets everyone involved and might be fun for older kids too. Thanks for sharing! Love this! I just found an awesome alternative to elf on the shelf too called The Shepherd’s Treasure…. It’s a Christian one and the Shepherd doll goes on a treasure hunt to find Jesus… the real meaning of Christmas… throughout December. There’s a Jesus doll too! I found it here: http://www.TheShepherdsTreasure.com. Thought I’d share because I just ordered one and am so excited to start this tradition with my kiddos! I was googling ideas people do with their elves that I can do with our Shepherd this year and I ran accross your blog! Great post btw! 🙂 THanks!